Like free-standing apple crisps, these babies are filled with a warm-spiced oatmeal streusel, then baked to perfection. You’ll be glad each is meant to be an individual serving, since you won’t want to share. For the streusel, combine oats, walnuts, brown sugar, cinnamon, ginger, and salt in a bowl; cut butter in with your fingers until combined and clumps form. Chill streusel until ready to use. For the apples, core apples, being careful not to puncture their bases. Arrange apples in a 7×11-inch baking dish. Divide streusel among apples (about ½ cup per apple), packing the wells firmly and mounding on top. Pour cider into the bottom of the dish and cover with aluminum foil. Bake apples, 20 minutes, remove foil, rotate dish, and continue baking until apples are knife-tender, 30–40 minutes more. Let apples cool 10 minutes before serving with ice cream. 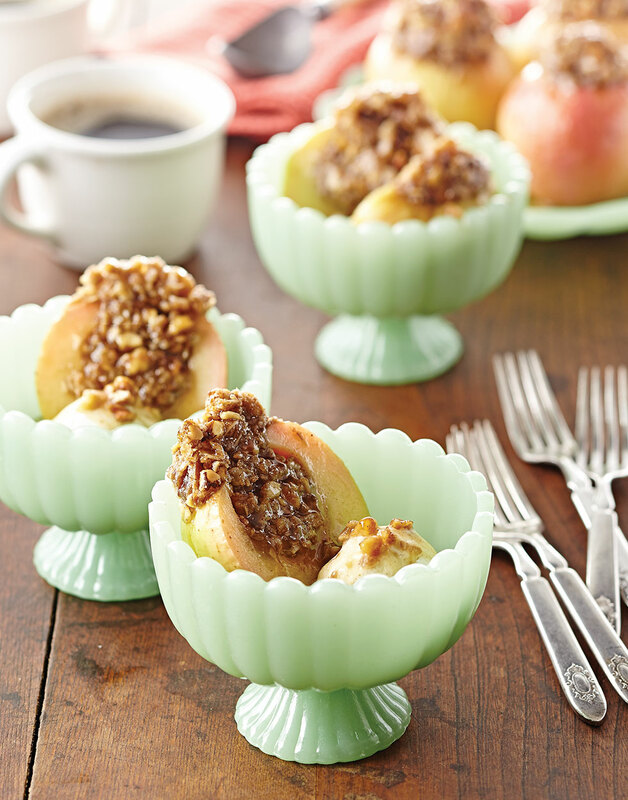 Use a melon baller to scoop out the core and enough flesh of each apple to hold a mounded 1/2 cup of filling. Squeeze streusel together in your hands to form clumps. This avoids ending up with a sandy streusel.